The most loved Russian Salad recipe is made with boiled potatoes, chickpeas, apples, carrots, smoked chicken, and some pineapple chunks. 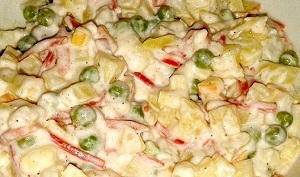 Fruits and vegetables are cut separately and then mixed together in the mixing bowl and lastly, smoked chicken is added. It is seasoned with mayonnaise, lemon juice, salt, pepper, yoghurt, and cream. Delicious and nutritious Russian salad recipe is best starter recipe to serve at lunch or dinner. In Pakistan, Russian Salad gained immense fame due to its delicious creamy taste. It is equally popular among children and adults. In Pakistan, Russian salad recipe is available on the menu of various restaurants. It is easy to make starter dish, and housewives can easily prepare it at home. It is advised to serve it cold. Following this Russian Salad recipe step by step gives you a perfect dish to serve your family and guests. Russian Salad recipe has become a main salad dish in various post-Soviet states, Russophobe communities, and Russia. Traditionally, this dish is served on Zukoski tables during New Year celebrations. Boil potatoes,peas and carrots separately untill they become tender.cut apple carrot and potato into small cubes along the pine apple pieces and pour the lemon juice over it.gently mix these vegetables and fruits and add small cubes of smoked chiken.then add all the mixture in a bowl of yogurt and stir well.serve cold. Russian or Olivier salad is a specialized salad which does not uses only vegetables but fruits and smoked chicken as well. It is a traditional Russian salad which has gained grown popularity in many countries of the world including Pakistan. You can find Russian salad easily in large hotels of Pakistan in Karachi, Lahore, Islamabad, Multan, Faisalabad and Rawalpindi. And with its recipe, it can be prepared at homes as well. So see in the recipe how to make Russian salad and have a good meal time. Russian Salad is a very famous form of salad which is most commonly used by people in dinners and lunches. however, we could also use it as light foods. Wow, this is looking cool I really like Mayonnaise so I love Russian salad recipe and other things are required today diner. Russian salad is delicious dist to eat. HERE some problems to makes it . how to use yogurt . I really really love the Russian salad. I made it for a dinner party last night for my people with this recipe. it was great and tasty. One of the most colorful salads out there. I love the taste and creaminess of this exquisite salad. I eat it edveryday after work!